There are many causes of hair loss in newborns. Actually, it's a common process in babies, unless it goes on longer than normal. In these cases, you should ask your pediatrician how to handle it. Hair loss in newborns is called telogen effluvium. This natural process usually makes parents nervous. This is especially true when hair falls out in patches, not completely. The causes of telogen effluvium are completely natural. With the exception of some conditions, all babies go through this process. The goal is to take care of your baby’s scalp and avoid cutting his hair before he turns three months old. This is because newborns control their body temperature through their head. Why do newborns lose their hair? It never ceases to amaze people how babies born with lots of hair actually lose it over time. In most cases, some of their hair gets stuck to their pillow or their high chair. Hair isn’t always part of the growth stage. In fact, this period of growth is three years, while the period of rest is three months. This doesn’t mean that all the hairs grow at the same time, or stays the same all the time. Only between 5% and 15% of hair is in the resting stage at a time. Hair loss in newborns is important to make way for new hair. While part of the hair is at rest, a part falls off to let new strands grow. This way, babies won’t be entirely bald. However, some children still could be. Some parents are surprised to find out their baby’s hair changes from when they were born. Generally, at birth, babies’ hair is darker and thicker than the new hair. However, babies with very light complexions have hair similar to the new one. When is hair loss not normal in newborns? Hair loss is only associated with diseases in very few cases. For example, if your baby’s scalp becomes red or inflamed, there might be some kind of fungus. The same happens where the skin is scaly. This can also increase hair loss. In this sense, it’s important not to confuse dandruff with milk crust. Unlike dandruff, milk crust is yellowish and thick. In addition, it doesn’t cause irritation, and is very common in newborns. Finally, hormonal disorders, thyroid problems or ganglia might cause newborn hair loss. Therefore, it’s important to mention this during your baby’s regular medical checkup. It’s a good idea to tell your pediatrician any physical changes that surprise you. Use clinical shampoo for babies. Most specialists recommend using neutral soaps and shampoos. They don’t have fragrances or colorants. This way, you can avoid causing an allergic reaction. Babies’ skin and hair are very delicate during the first few months of life. Bathe your baby in warm water. The bath water should be at an ideal temperature, neither too cold or too hot. Hot baths will stimulate hair loss, since it opens hair follicles. Carefully massage your baby’s scalp. Massages stimulate the scalp, although they can also cause weak hair to fall faster. Similarly, massages are also useful when there is milk crust. Change your baby’s sleeping position. Changes in sleeping position help prevent babies from losing hair faster in one specific area. You should also change your baby’s position when he’s in his chair. In short, hair loss in newborns isn’t something that should cause you to worry. It’s only cause for concern in very few cases. Soon, you’ll see new hair appear on your baby’s head and they’ll look like normal. 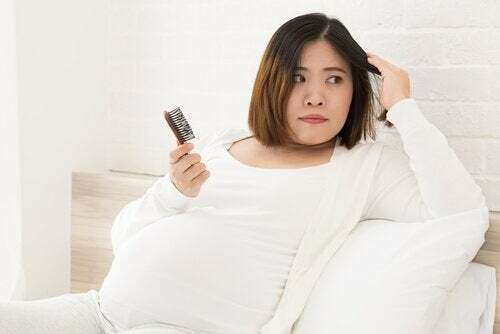 What to Do About Hair Loss During Pregnancy?